When the Germans began to fit the high power Fu 11 or Fu 12 radio sets to armored cars which retained their turrets and armament, it quickly showed that there was little room left for both commanders and staff members and the armament in the same space. As a result, the Germans quickly developed dedicated “high top” armored command vehicles based on the sasme chassis. Given the designator Sd.Kfz. 263, they were only based on the eight wheel variant. 240 of these vehicles were built and were primarily used with the “Nachrichtung” service – a rough approximation of the G-2 in Allied forces. DML’s new kit follows closely on their Sd.Kfz. 232 command version of the standard armored car. As with the previous model, it comes with its forward standoff armor/stowage bin, two jerry cans, and a spare tire or rear armored grille cover provided in the kit. Alas, most of the directions are copied verbatim from the confusing ones in the first kit. 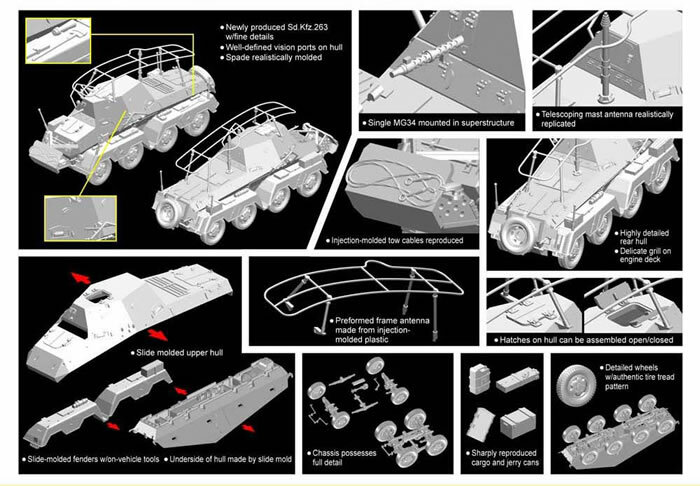 Step 1 it shows the two wheel bogie assemblies (two axles assembled together) as“optional” parts! It would appear that parts A6-B21-A7 make up one bogie and A8-B31-A9 the second one. They should mount with the A6 bogie in the front with the drive end of B21 towards the center and A8 in the rear with the drive end of B31 also facing the middle. Step 5 shows the option of fitting the spare tire or the radiator armored cover over the air grille. In Step 6, at least since the antenna is fixed to the hull there is no longer a problem with mounting it. Some parts are molded in place such as the tow cable on the forward armor and some of the fender details, but in this scale it is hard to get both scale effects and separate parts to work well. Five finishing options are shown: 79th Signal Battalion (Motorized) 4th Panzer Division, Belarussia 1943 (tricolor, no registration code); 1./Pz.Nachr.Abt. 37 (Mot), 1st Panzer Division, France 1940 (panzer grey, WH-233079); Nachr.Abt. 37, 1st Panzer Division, Poland 1939 (panzer grey, no registration code); 2nd SS Division (Mot) “Das Reich”, Eastern Front 1941 (panzer grey, no registration code); “RONA”, Warsaw 1944 (green over sand mottle, WH-97579). Targeted decals and a number jungle are provided by Cartograf. However, note that all four vehicles are shown without either the standoff armor or the spare tire or armored air grille cover. Also, due to CE requirements the twin “SS” runes are provided for the registration plates as two separate halves to be assembled on the plate decal. 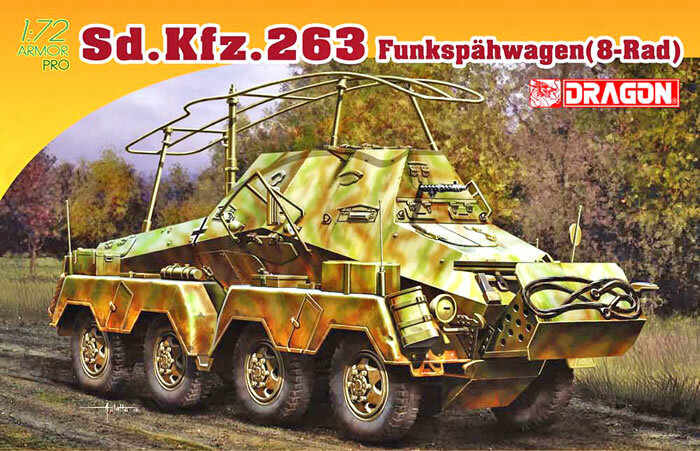 Overall this should be a popular model and go well with the earlier Sd.Kfz. 222/223 and Sd.Kfz. 232 kits.